Phaistos is underestimated in the guide books, and for that reason it was probably the most pleasant surprise on the whole trip, and one of the more interesting sites. For one thing (and this is a recurring theme with me) there was hardly anyone at the site, and atmosphere is an important element of all of life's explorations, especially when visiting ancient sites, where you must use your imagination to conjure up a once vibrant society from the distant past. Entering the site from the north, you descend a narrow staircase, which leads to some kind of gathering area, which has three staircases surrounding it, and which is labeled as a "theatre" on the plan given here, although I'm very skeptical about that (see the western part, on the bottom of the plan). Perhaps it's because I've built many stone staircases, or because staircases are one of the few things that remain in tact at many sites, but they were a particular joy to me at many locations. From there we explored some of the nearby storage rooms. 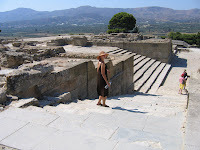 At Phaistos, they are very well preserved in many cases, or reconstructed very well, meaning that the walls are often above your head, which allows you to get a feeling for the room's space, without having to imagine walls from a pattern of stones on the ground. 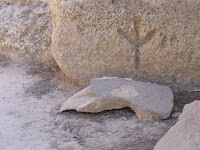 On several stones were carved signs (such as a double axe) and I wondered for a long time what purpose these served, perhaps decorative or informative or religious. 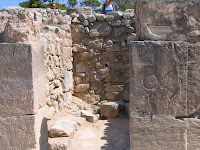 I recently was able to ask an archaeologist in my department, who is working on Minoan sites in Crete, and he informed me that they are mason's marks, and that these marks vary at different sites, and allow scholars to see what palaces were built by the same crews or designed by the same architects. 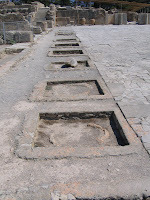 On the eastern side of the site is a large courtyard, which has the remains of footers for long stretches of pillars. 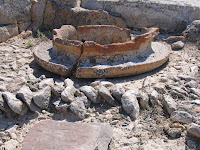 There are remains of an olive press and several other stone carvings that look as though they were designed to catch or to hold liquid for something. 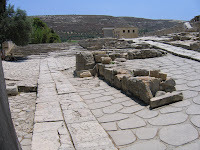 To the north and east of the courtyard are more rooms, and this is where the famous Phaistos disc was found in 1908. 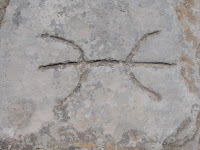 It has not been deciphered, and, in fact, there is little agreement about anything, even as to what the symbols represent, in what direction they are to be "read", and whether the disc even originated on Crete. My impression, which is worth absolutely nothing, of course, is that the symbols run from the center to the outer edge, simply because that seems, technically, easiest to me. There are groupings of symbols which are marked off by dividers, and could conceivably be either words or sentences; I imagine they are more likely to be words, and I think the safest guess is that the symbols represent syllables, but the length of the groupings could just as well indicate a consonantal or alphabetic script. But one thing seems clear, and is the most interesting aspect, in my opinion: that the symbols were pressed into the clay with molds, that is, in a manner of movable type. It is a fascinating object, and captured my attention for some time, even though there is very little intelligent material to read about it at this point. I was terribly disappointed that I wasn't able to see the actual disc, which is in the closed museum in Iraklion. When I first saw the reproductions which are for sale all through Matala, I found it objectionable at best, but it struck me later as a very clever paperweight, and it sits as such on my desk as I type this. I almost wish I had gone in for the set of coasters too. The drive across Crete to the southern coast was delightful. 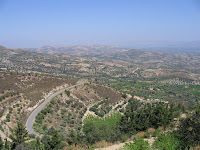 There were long expanses of olive orchards and fruit farms, and stunning views from the interior mountains. We drove literally through the parking lot at Phaistos (to which we would return the following morning) and continued to our destination, Matala, a small coastal town. 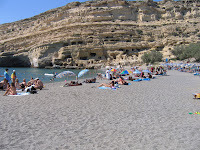 In the 1970s, young people flocked to Matala to live a communal lifestyle in the wonderful complex of caves near the harbor, which had been carved out originally in Neolithic times. There were lots of drugs involved as well. 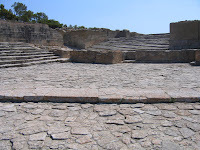 The town is somewhat more touristy now, but it is still cheaper than most places, and it was a wonderful place to spend a few days, because the beach was fantastic, and it was in close proximity to several ancient sites, including Phaistos and Agia Triada. The beach was small, and bordered on two sides by rock formations, one of which housed the aforementioned caves. There was a small rocky island out to sea, which gave it a great deal of character. During the daytime, especially because of the heat, I assume, people flocked to the clothing optional beach, and it was difficult to find an empty spot with an umbrella. At night, things calmed down a bit, but there were small bars and restaurants all along the beach and seaside, and there were always people still mingling when I called the night. At the very end of the boardwalk there was a restaurant built on wooden posts over the last rocks before the sea, and we ate a wonderful dinner there while watching the sun set on the Mediterranean. 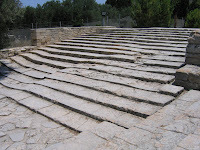 While the sea journey to Thera had been pleasant, the next leg, to Crete, wasn't: the boat was much smaller, and the waves were much larger, and it was all I could do to keep from vomiting. I kept staring out at the horizon the entire time, while in the periphery of my vision people kept running past me to the bathroom or to the stack of vomit-bags at the concession, which needed to be replenished more than once. 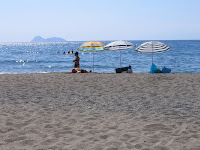 When we finally landed in Iraklion, we walked the few blocks to the Kronos Hotel, and I laid down on the bed for half an hour, until I felt myself again, and we headed out to the seaside to have a bite to eat. The next morning, we tried to enjoy breakfast in the lobby, as clouds of tobacco smoke lingered. We rented a car, and waited for it to be delivered, as the extremely friendly clerk became more and more annoyed that it had not arrived yet. He called the driver several times (I never did figure out from where it was being delivered) and spoke briskly into to phone, and then hung up, and smiled at us, and offered more complimentary water. 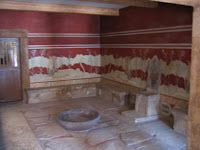 Our first stop was Knossos, which is just a short drive from the city. 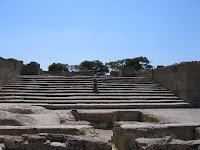 The parking lot was crowded, and we walked through the palace complex, as though out of obligation; it was not my favorite site, especially among throngs of people, who also must have felt obligated to go there. 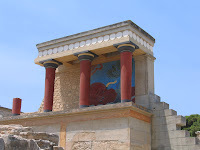 I don't mean to sound too down on the place: it is one of the most important locations in the ancient world, and I am fascinated by Minoan culture. 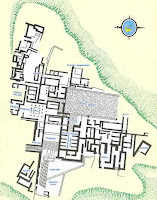 I am interested in the site as center of exchange with the Near East, in the culture which could imagine a capital with no defensive walls, in its relationship with mainland Greece, as the location of significant remains of Linear B, and, especially, in the remnants of myth, like the Labyrinth, and Adriane, Minos, and Daedalos, plus its appearance in other stories, such as the Hymn to Demeter and on the Shield of Achilles. But the reconstructions are more distracting than helpful, in my opinion, and are of debatable vision. 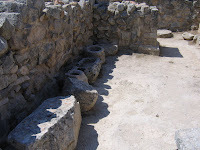 It was sometimes difficult to determine what walls were authentic remains, at least for someone like me, with an unfortunate amount of archaeological knowledge. 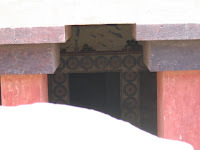 Plus, the reconstructions of the Hall of the Double Axes, and the Dolphin mosaic, were closed for repairs. (You will see a bit of this mosaic in one of the photos, for which I had to jump a barrier, and kneel down very low to the ground.) My favorite part was the staircase and long roadway that approaches the structure. 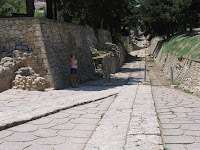 Afterward, we headed back into Iraklion to see the Archaeological Museum. 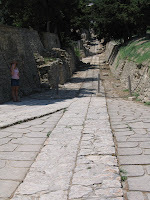 It was difficult to navigate the roads, and even more difficult to park, and when we finally arrived at the Museum, the entire thing was closed; it had been closed for almost 7 months, and it would remain closed for several more. I was terribly disappointed, since it is the second largest archaeological museum in Greece, and there were several things I wanted badly to see. I'm still unsure why the entire museum had to be closed, and why they couldn't leave some exhibits open in rotating sequence, but I'll assume there was a good reason. 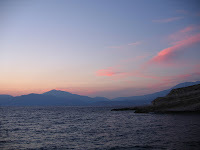 The next adventure was to cross the island of Crete to the south coast; the countryside was beautiful, and the drive pleasant, and the south coast promised to be less crowded and expensive. 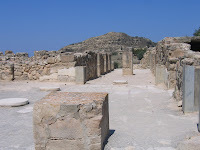 I came to learn later, that several of my fellow graduate students were excavating at that very time at a site in central Crete, by which I passed very closely. I'll return to Athens before flying out of Greece, but from here I move on to the gorgeous island of Thera (or Santorini). 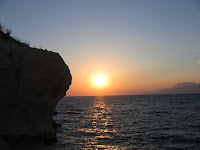 I had hoped to do some island hopping, and see at least three or four islands on the way to Crete, but, despite hastening through much of the mainland, I was running out of time, and decided to spend more time on the islands, and less time traveling. It was exciting to finally set sail on the Greek sea from the port at Piraeus, and I stood outside and watched as the mainland receded into the distance. Occasionally we would pass by some very small islands, which didn't seem to be inhabited as far as I could tell. 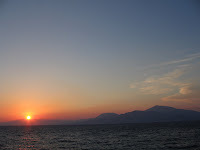 We passed between the islands of Sikinos and Ios before finally entering the harbor at Thera. As you move past the centralized island volcano and come into the port, the stark cliffs grab your attention. I probably don't need to mention that Thera is most famous for largely having fallen into the sea, making a once-circular island into something of a crescent shape with the ominous volcano at the middle. As we approached the docking station, it became clear that in order to get anywhere we would have to climb a frighteningly steep and windy road up the sheer cliff face. We could see buses and cars making their way up and down by zigging and zagging on a narrow road leading almost directly upwards. Our villa had arranged a transport for us, but we had to wait twenty minutes for the next boat to arrive with some other guests, so we sat around and had a cool drink. On the ferry we met a man who owned a coffee shop at the docks, but it was too hot for a coffee in the middle of the day during a heat wave. 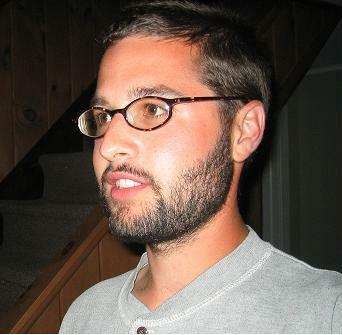 He spent part of the year in Chicago, and the rest of the time on Thera, and it was clear that he knew the ferry system well enough to sneak into the cabin section of the ferry without paying: he kept looking around awkwardly and taking a seat until someone came up to him with tickets and asked him to move. When we finally started the ascent up the cliff face, I could hardly look over the edge. It didn't help that our driver felt it necessary to pass a car on the first stretch, with a bus coming down the hill at us. Full-sized tourist buses and vans and cars all drove much too quickly, and then came to abrupt halts just at the hairpin turn, where, invariably, there was a bus coming around that couldn't make the turn clearly, so we would have to wait patiently. I was honestly surprised that I didn't see any accidents. Once at the top, the view was astounding: on one side the island sloped off gently to the sea in the distance, with green land, as any island might look; and on the other side the island fell immediately into the sea with colorful, vertical cliffs. There was, as I mentioned, an island volcano at the center, and a larger island off to the north-west, and a few other islands to the south-west; you could see each end of the largest, crescent-shaped piece of the island. Our villa sat on directly on the cliff at the highest point on the island, with a breathtaking view that would be the focus of our stay there. The island itself is interesting, but I could have sat and pondered at the vast harbor that was once land: I simply could not imagine that one day it was a huge island, and the next, most of it was gone. The western cliff faces were completely and utterly covered with the stereotypical white buildings that you probably associate with Greek islands. You could walk several kilometers to the next town on a path that went through the balconies and patios of other homes and visitors and restaurants. We found one of the most fantastic restaurants that we would experience, and ended up eating there three times before we left; if you ever get to Thera, make sure to visit Skaros. The tables looked out onto the harbor, and the menu was only a formality, as the waiter would encourage you to try the fresh seafood of that morning, or, at least, some special design of the chef. The service was friendly, and the food was amazing, and the wine, as everywhere on Greece, was local and delightful. My only experience with Greek wine was the dreadful bottles you are lucky to find in a wine shop in New York, but the fresh, local wine of the different regions of Greece, made from grapes that I've never heard of (and can't remember now) were always tasty and crisp. And the digestifs were always offered enthusiastically; if you refused, they would insist that you have one on the house, and the waiter would always join you, which must have become difficult by the end of the shift. 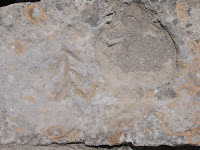 There were several Minoan settlements on the island, and the famous Thera fresco depicts what might be a map or a visual narrative, with boats leaving one piece of land, and arriving at another. There are different types of boats, and even some instances of people falling out of the boats into the sea. It would be fascinating to learn the context. Luckily for us, when we returned to Athens, we discovered that there was a special exhibit dedicated to Thera.